With the pain visible in his face and the tears rolling down his cheeks, Sergio Aguero trudged off the pitch at the Ethiad Stadium on Saturday and straight onto Manchester City’s now heaving injury list. Scans have confirmed that the Argentine striker has a twisted medial ligament meaning he is likely to be out of action until early next year. The injury to arguably City best player this season is a bitter blow as they compete on multiple fronts for honours. It’s not quite been the start to the season that many expected from the current English champions. Slow out of the blocks in the league and struggling to find their footing in Europe, the pressure was building on Pellegrini as Aguero slowly returned from a hamstring problem that hindered his displays at this year’s World Cup. His reintroduction to the starting eleven has seen resurgence in form that has propelled City back up the table and back into contention, both at home and in Europe. Aguero has been in blistering form so far scoring 19 goals in 20 matches in all competitions. 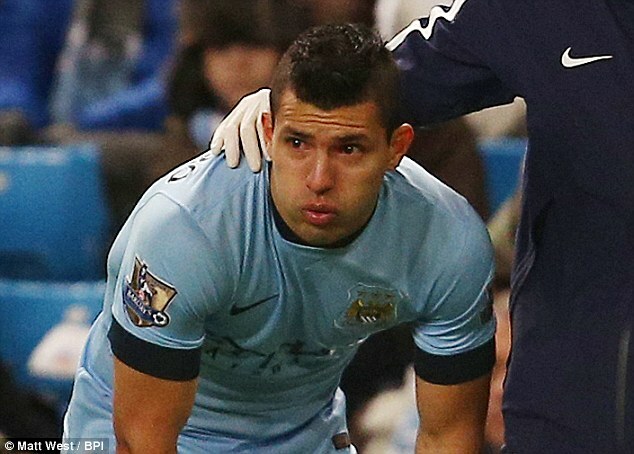 But this latest setback – his third knee injury in as many years could threaten to derail Manchester City’s season. With injuries to key personnel like David Silva and Vincent Kompany as well as a drop in form for several other instrumental players, the news that Aguero could be out for a considerable period of time is hardly what was needed. City face a make or break game against Roma in the Champions League tomorrow with no less than a win needed to secure their passage into the next round. Roma need a win to progress so it will be a winner takes all scenario. However there is a chance that both teams could be disappointed if CSKA Moscow can go to Germany and convincingly beat table toppers Bayern Munich meaning that they would progress. Whilst unlikely that the Germans would roll over, the chance to progress and eliminate both Roma and City in one go may tempt them to field a reserve side in this match. Failing to advance would be seen as a failure by City’s owners who after tasting success domestically now pine for similar success in Europe. The Europa League may offer a chance at redemption for Pellegrini if his side can finish third in the group but it’s certainly not the prize that the clubs wealthy owners had in mind. Back home in the league, City are chasing down leaders Chelsea who stumbled to their first defeat of the season on Saturday against Newcastle. Pardew’s side are going through a positive spell as late that has seen them leap back up the table after spending a few hair raising weeks rooted to the bottom of it. The defeat helped to cut the gap at the top between City and Chelsea to three points with the pair set to meet at the end of January. Before then City have seven matches to play, all of which are very winnable against sides much further down the league. In stark contrast, Chelsea’s next seven games pit them against more formable opponents such as Stoke, Southampton, Tottenham and Newcastle so by the time the two meet, City could already be top and in a commanding position. However doing so without their talisman Aguero may make the task harder for Pellegrini’s men. The extent of his injury is still being assessed by generally this type of injury could rule a player out for up to three months, potentially longer if surgery is required. For City’s sake, they will be hoping that Aguero responds well to treatment and will come back sooner but rushing him back could have long term detrimental effects to the players knee, given that this is not the first time he has hurt it. If he is to be out for longer, dipping in to the January transfer window to buy or loan another striker may help Pellegrini in the long run. City has the funds to do so and with the owners demanding success, it may be the only course of action if City are to finish this season with silverware.